Big, pouty lips seem to be the thing to have in the beauty world at the moment, if we're not thinking about lip fillers then we're grabbing our nearest lip liner and over-drawing those bad boys to achieve the perfect pout! For me personally lip fillers would be something I'd NEVER do, but that doesn't stop me wanting more plump lips, so when I heard about the PMD Kiss Lip Plumping System I was really intrigued to see if it worked! The PMD Kiss* is a smart anti-ageing lip plumping treatment that uses a pulsating vacuum along with a serum that claim to safely boost collagen in the lips to create more volume and reduce the appearance of fine lines and wrinkles. Inside the box you get the device itself which is hand-held size (it's smaller than my IPhone for reference), a 5ml tube of the Smart Lip Plumping Serum, a USB charger and two different sized plumping tips. 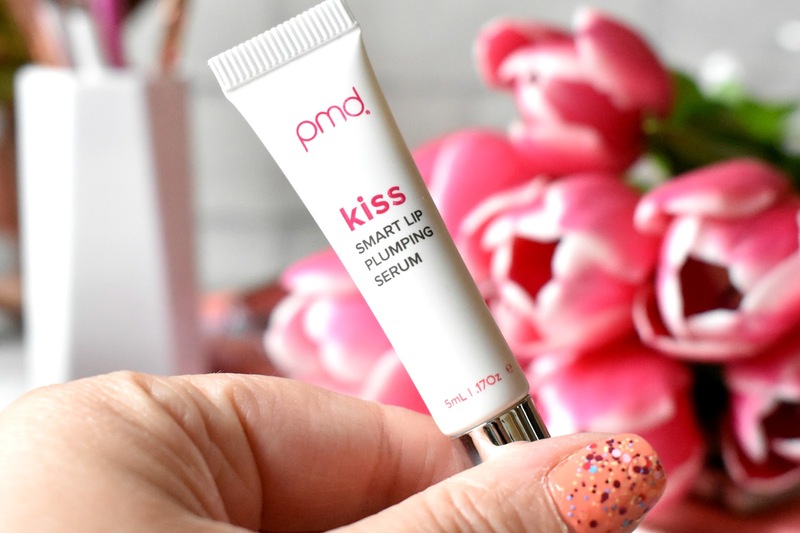 To use the PMD Kiss you simply pop some of the specifically formulated serum onto clean - dry lips, the serum tastes and smells just like toothpaste and has an ever so slight warm/tingly sensation too it when it's first applied but it's not intense at all. After the serum is applied you pop on the PMD Kiss and firmly press the plumping tip onto your lip creating a tight seal to create suction. You then use the plumper in six sections of your lips - so the left, right and centre of your top and bottom lip - you do this for around 10-20 pulses on each section which you can hear which makes counting whilst it's doing it's thang pretty easy. You can also use the PMD Kiss on the inner lip tissue as well as the outer lip tissue to create extra fullness if you wish, I haven't done this as I like the results just from the outta tissue but I like the fact the options there. The device also has two speeds, you can either go for the standard speed for a quick plump and low speed for a more intense, targeted plump. You can use the PMD Kiss as often as you like as it is safe to use, I use mine everyday as it's so quick and easy, it literally takes 2 minutes. I haven't had a single issue since I started using mine either, it never hurts or feels sore, it never feels uncomfortable or tight when it's on and I've found the results really good! I've always been quite happy with my bottom lip to be honest but my top lip is thin and not very pout like but I definitely feel after using the PMD Kiss my pout is much fuller and my top lip has more volume! As you can see from the before and after pictures the PMD Kiss definitely makes my lips appear fuller and the overall shape of my lips looks more pouty, the only little niggle I have is that the serum does make my lips a little dry afterwards as you may be able to tell in the after picture but it's nothing a little lip balm cant fix! Overall I absolutely LOVE this little device and cant recommend it enough if you want you lips to look fuller! You can find the PMD Kiss for £125.00 HERE.